Back in 1997, Celtic paid Dutch club Feyenoord just £650,000 to sign Swedish international striker Henrik Larsson and Parkhead has not seen quality like his since. This summer, the Bhoys and boss Brendan Rodgers paid a club-record fee of £9m to sign Odsonne Edouard from French champions Paris Saint-Germain, but the 20-year-old will have to hit some serious heights if he is to ever get close to Larsson in the estimation of Celtic fans. The France U19 international netted 11 goals in 29 games while on loan last season, which clearly convinced the Celtic hierarchy to splash the big bucks, and he has since got four in his first nine appearances in all competitions during this campaign. However, despite the obvious talent Edouard has he will struggle to live up to the standard that Larsson set for all modern strikers at Celtic Park. The Swede was an elegant striker who frequently scored all types of goals from headers to long-range screamers, but one goal in his career in Scotland stands out for a number of reasons. In the 2000/01 season Larsson came back from a broken leg the season before to help knock Rangers off their perch as reigning Champions. Celtic ended up winning the title with a 15 point gap to their Old Firm rivals and Larsson, as well as winning the league’s golden boot with 35 goals, took home the European Golden Shoe with a quite incredible 53 goals in 50 appearances in all competitions. In the fifth game of that campaign, which was Martin O’Neill’s first season as manager of the club, Celtic would take apart Rangers with a 6-2 drubbing at Celtic Park, and it was Larsson’s first goal in this game that summed up his career so well. The Celtic striker had missed a couple of chances already in the tie before Chris Sutton chested down a long ball into his path. Larsson took the ball at full tilt, nutmegged Dutch international defender Bert Konterman and chipped the ball nonchalantly over Stefan Klos in the Rangers net, displaying all the skill and confidence that made him such a success during his career. Larsson would go on to score 242 goals in 313 appearances for the Bhoys across seven seasons before moving to Barcelona on a free transfer in the summer of 2014. His contribution to the club was immense though and Celtic won four SPL titles, two Scottish League Cups and two Scottish Cups during his time. 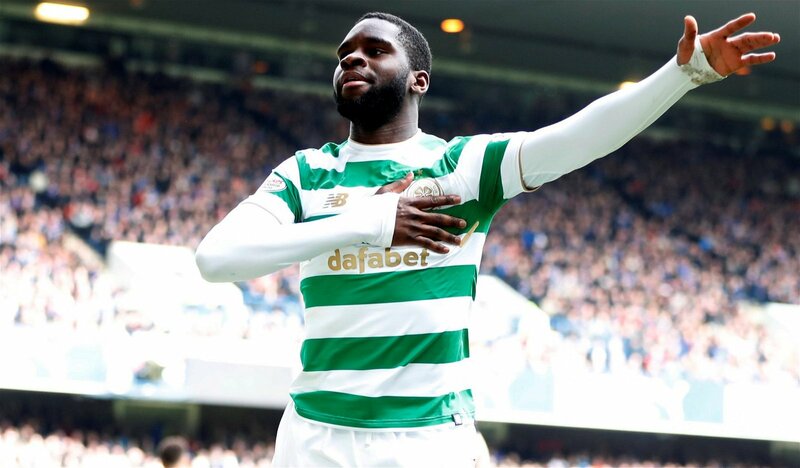 With Rangers undergoing somewhat of a resurgence this season under new boss Steven Gerrard, Celtic fans will need to hope that Edouard can fire them to a defence of the double treble that was secured last year. The young Frenchman will need to do great things under Rodgers if he is to ever get close to the love for Larsson, and not many in world football will be able to come close to the Swede’s grace on the pitch, proving how big the task ahead of Celtic’s new record signing is.